1. Roast all the ingredients listed under 'To Roast and Grind' until fragrant around 2 minutes and grind to coarse powder. 2. 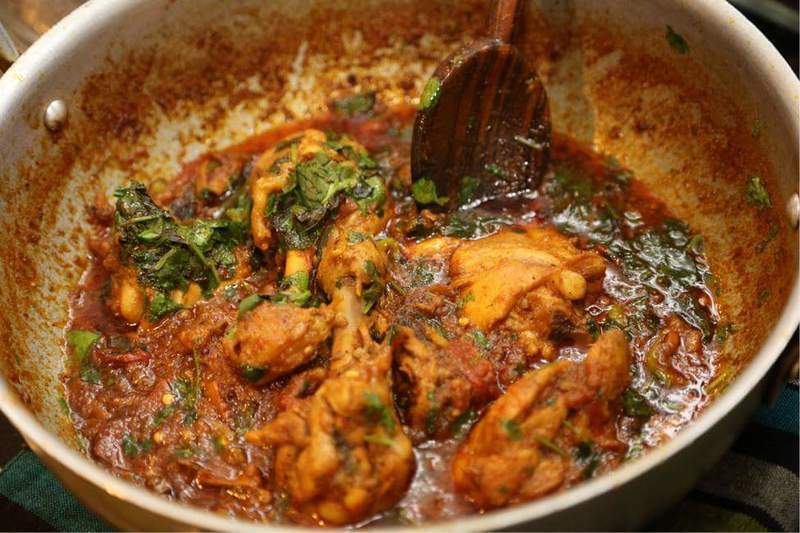 Clean and cut chicken in bite size pieces and marinate with half of masala we grind with 1 tsp of ginger-garlic paste, turmeric powder, 1/2 tsp salt, lemon juice and mix well, keep aside until required. 3. Peel and slice onion, chop coriander leaves and puree tomatoes. 4. In a pan or wok heat oil add bay leaf, cloves, cardamom and saute for a minute. Add onion, ginger-garlic paste and saute until onion becomes soft around 2-3 minutes. 5. Add remaining powder masala and mix well, saute for a minute. Add tomato puree, stir and cook in medium flame until oil separates. 6. Add chicken pieces and mix well, cover and cook for 3-4 minutes or until chicken start getting tender. 7. Now add salt, 1 cup water and bring it to good boil cover and cook for 12-15 minutes or until chicken pieces becomes soft and gravy thickness, add capsicum pieces stir well, cover and cook for 5 minutes in medium heat or until capsicum gets cooked and gravy becomes thick, oil separates. 8. Add garam masala stir and off flame. If there is little gravy left it's fine,it will be dry after some time. Abhinay Hello Ishi, "Roast all the ingredients listed under 'To Roast and Grind' "